Money has a funny way of inspiring people to perform even better than expected. This is true in several career paths and certainly doesn’t exclude baseball. In baseball, the money up for grabs is anywhere from the league minimum of $400,000 to the $27.5 million Alex Rodriguez of the New York Yankees makes annually. Salaries are based on a combination of what a player has done and what is reasonable to expect he can do. Top performers in their mid- to late twenties and early thirties are those who can expect the big bucks. Players can either sign a contract extension with their current team or they can wait until their contract expires and they become a free agent. Both scenarios have pros and cons. What happens when the best hitter in the game—without a doubt currently, perhaps even all-time—has a contract year? We are about to find out. 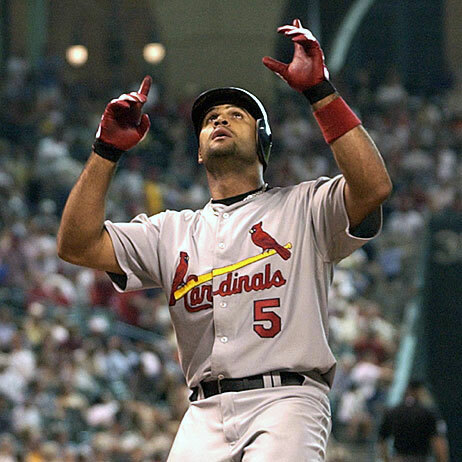 Albert Pujols, St. Louis’ first baseman, is no longer in contract negotiations with the Cards because he doesn’t want to distract himself or the team from getting ready for the 2011 season. As a result, the 31-year-old Pujols could have additional motivation to perform in the upcoming season. Just to note, Pujols has never hit 50 homeruns in a season (although he did slug 49 in 2006), he has never driven in 140 runs (once again in 2006 he drove in 137) he has never had an average of .360 (he hit .359 in 2003) and he has never scored 140 runs (in 2003 he scored 137). A true career year for Pujols would be nothing short of legendary. A line of 140 runs, with 50 homeruns, 140 runs batted in and a .360 average would be next to impossible. In fact, it would be unreasonable to expect any player to reach one of those plateaus. Yet the only one of those categories Pujols hasn’t come within a stones throw of more than once is the 140 runs. His second best season (2004) he only scored 133. Even Albert’s 162 game average—123 runs scored, 42 home runs, 128 rbis and a .331 average—will scare every pitcher who has ever played the game. This is a career year for most players. It really doesn’t matter how good a season Pujols has. Teams know what he is capable of and a bad season shouldn’t diminish the pay day he will receive. I hate to say he deserves over $30 million dollars—it is hard to say anyone deserves that much to play a game—but he does deserve to be paid like the best player in the game. That means $27.5 million per season very well could be a starting point. Unfortunately for Pujols, the teams most often spending the big bucks, the New York Yankees, Boston Red Sox and Philadelphia Phillies, already have their first baggers—Mark Teixeira, Adrian Gonzalez and Ryan Howard—locked up for several seasons. That leaves the Chicago Cubs as the top team willing to spend stupid amounts of money on a player, as well as any surprise team that may drool at the prospect of locking up the best player in the game long term. To make next season’s free agent first baseman market even more interesting, Milwaukee Brewer’s slugger Prince Fielder also hits the open market. The season he has coming up should impact the contract he gets more so than Pujols. Prince may also reap the benefits of a team missing out on Pujols, a team falling back on him as a secondary option. Fielder’s numbers do not compare with those of Pujols, but they do compare nicely to some of the other top paid players in the game such as Ryan Howard, Joe Mauer, Mark Teixeira and Carl Crawford. At 26, this season will also help establish what Fielder’s ceiling is and what can be expected of him as he enters the prime of his career. If he can hit 50 homeruns and drive in 119 runs like he did in 2007 then he could see around $20 million per season for 5 or more years. With the short porch in right, maybe the Yankees make a play for Prince to be a full-time DH? Probably not likely, but I bet it crossed their minds in the Bronx. If the BoSox hadn’t gotten Gonzo they probably would have robbed a bank to pay Pujols. It will be interesting to see what happens with the Yankees and Red Sox not in need of 1B or DH. 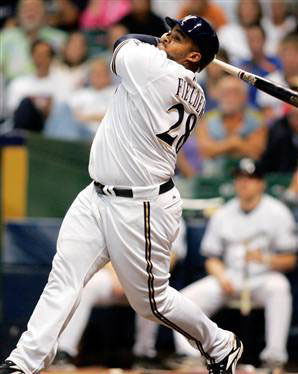 The Yankees could jump for Fielder but I don’t really see it happening. It would be good for baseball to see those guys go to mid-market teams. Predictions on where Pujols ends up anyone? I think he will end up back in St. Louis. I don’t think St. Louis can let him walk and Albert is going to want to stay put – can other big money teams make a bid? You betcha – but at the end of the day Albert just wants to stretch it out to make sure St. Louis doesn’t skimp him on what he’s due, and what he is due is partial ownership. The man is the beginning and ending of the Cardinals franchise these days, everyone else can come and go. Jason, you and I seem to agree on %95+ normally, but I disagree completely that Albert deserves an ownership stake in the team to go along with the 300mm he’s asking. And this is coming from a Cardinal fan. St.Louis fans aren’t going to abandon a Pujols-less Cardinals. Would it hurt to lose him? Almost unimaginably so, but how much can one position player mean to a team? As I said and as most of us probably know, Cards fans are among the best in baseball and will keep filling the park whether Albert is around or not. Merchandise? Eh, I obviously don’t know the specifics, but I’d almost bet that the MLB see’s as much, if not more of the merchandise revenue than the team itself. Yes Pujols is a brand and yes there is money to be lost if he leaves, but you’re also not spending 300 million and giving part of the team to 1 player, which is just absurd. Albert is a game changer, but lets see if he can put this team on his shoulders and carry the burden of losing Adam Wainwright. Without Wainwright the Cards project as an 83 win team and likely playoff % drops from 35% to 20%. Wainwright is a MONSTER loss to this team. If Albert can sack up and EARN the FA money he’s asking for then he has to do it this year and he has to do it big time. Albert noticeably struggled at times last year when the bullpen, Holliday etc were struggling and it was obvious he was trying to do way too much. Swinging at bad pitches, reaching, striking out more, hitting way too many weak pop ups. Now he’s going to have to shoulder that load for real. Let’s see if he’s worth it. I love the comment, Mac, and the passion – it’s what makes Cards fans great. The atmosphere in Busch stadium rivals anywhere in MLB including Boston & New York. Awesome, awesome fans. Wainwright is also a stud – if you remember, I pegged him as one of the top five most valuable pitchers in baseball. And you’re right – huge loss for the Cardinals. However, pitchers are pitchers – pitching 200 IP is a big accomplishment, but the team plays another 1,200+ without you. Losing Wainwright will only hurt the Cardinals in 32-34 games (typically 32-34 starts per season for a SP). Losing Pujols would hurt them for 162 games. This is why in the baseball ops world money is allocated in the direction of position players more so than pitchers – first of all, pitchers bounce around statistically from year to year more so than positions players and are always one throw away from being useless. Second, like I already mentioned, they only play 1/5th of the season, at most. Will St. Louis fans keep coming to games if Pujols leaves? Of course they will. They are awesome fans. Will Pujols alone sell 2,000 extra season tickets to any team he decides to go to in free agency, no doubt. Can you imagine how fast Cubs tickets will sell out if he signs there? You will have to get a Pujols jersey on back order. 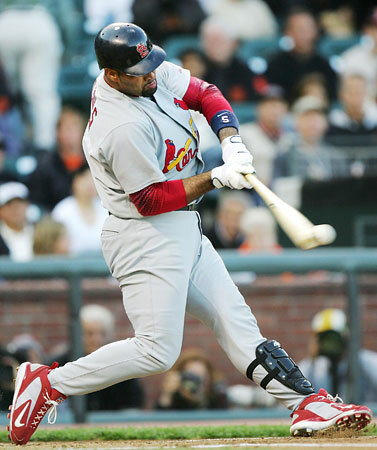 Statistically, Pujols is the only player in history to go .300-30-100 in his first 10 seasons, so to ask Albert so sack up? LOL. When did he ever sack down? Even Babe Ruth had a down year in 1925. Pujols has already finished 1st in the NL seven of his first 10 seasons – so in seven of the last 10 years nobody has been statistically more valuable to their team than Pujols (and those other three years some guy named Barry Bonds was going all BALCO on the league). You can argue intangibles, butts in the seat, value to the organization, and other things that can’t be measured, but those numbers don’t lie. When you start saying things like “only player in history,” I’d say he has earned his money. The Machine is no joke – most consistent hitter in baseball history is not an opinion, it’s statistical fact. I guess I just see a player owning part of the team because it was written into a contract as being a whole ‘nother can of worms. I’d vote for it never being a possibility. As for for Albert wanting 10/300m. It gets sticky. Obviously we all know Albert has shown no reason not to expect that he’ll be producing well into his late 30’s(barring injury of course), but to guarantee to pay that much per year to a player that age with so many unforeseen variables…it’s a potential franchise crippling contract on many levels. I wanted to crank out a big post about the entire Albert contract thing but I can’t really say anything that hasn’t been said already or give any new information. I can say this though. It’s one of the few, if only, time in my life that I actually agreed with loudmouth Kenny Williams. When he spouted off about the whole Albert thing I found myself saying “how the hell is this really Kenny Williams that seems so logical?”. You’re right – by giving Albert 10/300mm, you’re paying him for the first 5-7 years and the three on the end to waive his cap to the crowd and thank him for being one of the best players to ever wear the jersey, Jimmy Dugan style. I wasn’t serious with the ownership stake, just a metaphor for how much the Cards owe him. It also helps to live in constant denial about the subject also. I’m like a kid who refuses to believe his parents might get divorced.